I know for a lot of people legalize or legal mumbo jumbo is confusing. Believe me, I fully understand because some of it is still confusing to me. But the more I read about it the more I begin to understand it. That being said, some of what I am going to talk about may take repeated readings for you to understand. First, let’s start with some very basics. Prior to the Constitution being ratified in 1789 we did not have 3 branches of government, there was only the Congress, and they were weak and unable to fully manage the affairs of a young nation. So a group of men got together in Philadelphia and sought to remedy the flaws in the Articles of Confederation. After coming up with this ‘new’ Constitution they had to get the states approval for it to go into effect. During that time there were heated discussions on both sides of the issue, from those who supported this new Constitution, and those who opposed it. The two main issues which fueled the debates argued by those who opposed the Constitution were; the safeguarding of individual rights and the protection of state sovereignty in regards to the powers granted this newfangled federal government. These anti-federalists felt that the new Constitution provided too much power and would lead to the erosion of rights, both by the states and by the individual. I’m beginning to believe they were wiser than we all gave them credit for, but that is the subject for another article. Anyway, this new Constitution was agreed upon, ratified being the correct term and went into effect creating the outline of the system of government we have today. It established 3 named branches of government; the Executive, or President; the Legislative, or Congress; and the Judicial, or the Supreme Court. Each brand was given specific duties and limits were imposed on their powers. The Legislative was to create law with the qualification being that it could only enact law upon the specific subjects found in Article 1 Section 8 of the Constitution. The Executive was to either give the thumbs up by signing a law, or the thumbs down by vetoing it. Once enacted though it was the Executives job to see that the law was fully implemented. In that the Executive is like a CEO in that it makes sure things run smoothly. Then the Judicial was to settle disputes under the law. Therefore I have a question. We all know what happens when we break the law; the police come and charge us with a crime and if found guilty we are either fined, face jail time, or if the crime is serious enough, we may even face the death penalty. I can’t count all the agencies with the power and authority to enforce the various laws they have passed, yet I can name a few. We have our local police departments, the sheriffs who represent our counties, then there are a myriad number of state agencies which impose regulations upon us, and then there are the federal agents who can come after us if we break one of their laws. Among these are the FBI, the BATF, U.S. Marshals, and Secret Service Agents, just to name a few. All these agencies can punish us when we break one of the laws they have enacted. But what happens if one of these laws they enact is unjust? It does not matter to them if the law is unjust, the enforcers, as I prefer to call them, come after us no matter what. But how do we obtain any kind of justice when those who take an oath to support and defend the Constitution no longer do so and enact laws which the Constitution does not grant them the authority to enact? Is voting them out of office the next time they come up for re-election justice? I don’t think so, not when they can take our property through fines, put us in jail, or take our lives should the offense be serious enough. Now this is where it gets a bit complicated. Have you ever tried to read a Congressional Bill? I didn’t think so. I have, and believe me, they are a nightmare to untangle. More often than not they are written in such a way that it would take a team of lawyers months to figure out what they actually say. Often they read as follows: “Subsection 3, subparagraph b of Section 301 of Title 26 USC is amended to read... ” and then you have to go to that section of the United States Code to see what it originally said, then read how the amendment modifies it. You have to do this over and over and over again to see what a Congressional Bill actually says. And then there are the idiots like Nancy Pelosi who say that we have to pass a bill before we can find out what it actually says. Yet these laws are binding upon us all and enforced with an iron will and often without any mercy. If you have ever served on jury duty at the end of the trial, before you go into deliberations, the judge gives a little speech to the jurors. He tells them what the law is and to only consider the law and how the facts of the case apply to it. You are never asked to consider whether the law is just, or unconstitutional. Yet that is the right of every juror. Judges, and the court system in general, are supposed to provide us with justice. How can people’s and state’s rights be secure when the justice system twists the law to defend those who enact unjust laws from the get go? I’ll give you an example. Now I’m only using this subject because I am more familiar with it than I am with others, it does not change the topic of this article to one about gun control or the Second Amendment. The Second Amendment states that the right of the people to keep and bear arms shall not be infringed. It does not say that the states may enact laws which violate the rights of the people, or that the federal government may put restrictions upon people to better the public safety, only that our right to keep and bear arms shall not be infringed. Also it does not define arms any more than the First Amendment defines means of communicating when it protects our privacy. So for those who say that back in 1789 there were no automatic weapons, I would throw back at them that back in 1789 there were no cell phones or internet and therefore your privacy is not protected there either. Yet depending upon what state you live in you may find yourself subject to laws which prohibit you from owing certain types of arms, limits upon the capacity of magazines, restrictions or requirements for obtaining a permit to carry the arms you are allowed to own. What part of our right to keep and bear shall not be infringed do these lawmakers not understand? Yet increasingly I have seen videos of local police harassing people who openly carry arms when it is perfectly legal to do so…just because someone who is afraid of guns calls them to report someone with a gun. I have read numerous articles where the BATF has performed military style raids on businesses who were suspected of violating some federal law regarding the sale or transfer of firearms. If keep and bear shall not be infringed means that no agency can tread upon that right then how are these laws justified? Yet the enforcers come after everyone who violates them, the Courts prosecute us for violating them. And our lawmakers continue to push for more restrictive laws which further violate our unalienable right. Again I ask you, if our government is bound to adhere to the Constitution as being the Supreme Law of the Land, and they continue to enact laws which are unjust, how do we obtain justice against them when the entire system is corrupt? I have used this quote many times before, but I will use it again here because I think it applies nicely. The Sixteenth American Jurisprudence is the nation’s legal encyclopedia. It provide definitions for legal terms and legal maxims; things that are commonly accepted as being legal truths. In Section 256 of the Second Edition of 16th American Jurisprudence it states, “The general rule is that an unconstitutional statute, though having the form and name of law, is in reality no law, but is wholly void, and ineffective for any purpose; since unconstitutionality dates from the time of its enactment, and not merely from the date of the decision so branding it. No one is bound to obey an unconstitutional law, and no courts are bound to enforce it.” Yet try disobeying an unconstitutional law and see what happens to you. So again, I ask, where is our justice? I’ll tell you where it is, it has gone down the toilet with the rest of our liberty. 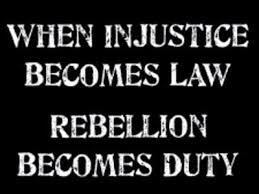 When a government becomes so big, so powerful that it can enact whatever laws it wants and then has the manpower, the ‘standing armies’ to go around enforcing the laws they enact, no matter that they be unconstitutional, we have tyranny. Our rights are supposed to be equally protected for all. When the rights of one group are diminished because other groups do not like us exercising them we do not have justice. If the rights of one group; be it based upon religion or nationality are given priority over those of others than there is no justice. We are told that our children cannot pray in school because it offends others, but our children are being forced to learn about Islam. We are told that if we stand up for White heritage we are racist yet every other race in this country has organizations, and even months dedicated to their heritage. Where is the justice in that? Again I will tell you, it has gone down the toilet. I do not have an answer to this, especially when so many are completely ignorant regarding what the Constitution says our government can and cannot do. I do not have an answer when we are so divided along our beliefs regarding certain key issues that are of important to us with little to no regard for equality of rights for all. I can tell you though that our government will continue to take advantage of us not being the United States of America and will continue to enact laws which violate all of our rights. Until we unite, all 300 million of us, there will be no change in this country. Unless we put aside our petty differences and begin demanding equal rights for all, and by equal rights I do not mean rights provided for some at the expense of others, then this country will remain divided and things will continue to get worse.